If you’re going to spend time on the road in an RV, then you want to make sure that you’re always prepared for anything that may happen on your journey. While you can stay ready with things like a flat tire kit and road flares, it’s still nice to know that there’s someone you can call. Roadside assistance plans for RVs are an excellent way to protect yourself on your next trip. Rather than relying on your own skills to get you out of a tight spot, you can depend on the professionals if you’re ever in a jam while traveling. Today we’re going to check out the best roadside assistance plans for RVs, as well as discuss the various elements that should be included so that you know what to expect. Your time on the road should be having fun, not worrying about a potential disaster. As we’re about to see, when it comes to roadside assistance plans, there are those designed for RVs specifically, and those that can be upgraded to include RVs if you choose. Fortunately, Good Sam is one of the former, meaning that they are well-equipped to handle any potential issues you may face on the road. Overall, I highly recommend buying a service that specializes in RVs, since many standard roadside assistance plans are designed with cars, trucks, and SUVs in mind instead. This way, you can be sure that you won’t have trouble getting help when you need it. Let’s see how Good Sam takes care of you and your family. Breaking down on the side of the road is never fun, and much less so when your vehicle is an RV. Typically speaking, if you need a mechanic during your trip, finding one that is well-equipped to handle your motorhome can be challenging. Fortunately, Good Sam provides RV specialized mechanics whenever necessary, meaning that you can drive with confidence and peace of mind. Also, because the mechanic can come to you, it’s much cheaper than getting towed to the nearest auto shop, and you can be on your way much sooner as a result. If you don’t own the RV in which you’re traveling, you may assume that your roadside assistance coverage won’t apply. Thankfully, Good Sam has you protected no matter what, thanks to the fact that they will assist you regardless of whether you own the vehicle or not. Whether it’s a rental, a lease, or even a borrowed RV, your coverage is still valid, assuming that you don’t have the lowest plan they offer. 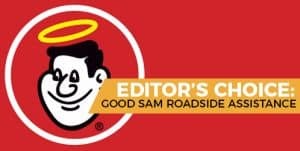 Overall, I really appreciate that the Good Sam roadside assistance is designed for RVs. Unlike other options that are typically made for cars and trucks (but can be adjusted to add a motorhome), you’re well protected in case anything goes wrong. Good Sam is much more prepared to handle your situation than most other plans would be, particularly with the option for an RV technician to come out and repair your vehicle on the road. Because of this, you can potentially save a lot of money and headaches if something does happen. Although the primary coverage is perfect for emergencies, you have to pay a relatively high amount per month to get all of the perks of membership. Because these costs are higher than some other plans, I mostly recommend this service if you RV regularly or full-time. When shopping for the best roadside assistance plan for your RV, one of the primary questions you’ll need to ask yourself is the kind of coverage you want. For the most part, you can decide between an emergency plan that bails you out when disaster strikes, or you can buy something a bit more comprehensive. Typically, if you decide to add roadside assistance to your insurance plan, it will mostly cover emergency procedures, such as towing and flat tire repair. This membership from Allstate is a perfect example of this. Let’s see how it compares to something like Good Sam. One element of any roadside assistance plan should be access any time day or night. Although you may not be driving on the road during the wee hours of the morning, it’s nice to know that if you do decide to stay out late or get up super early, you can still expect assistance. If disaster does strike during off hours, it’s nice to know that service is just a phone call away, no matter where you are or what time it may be. Typically speaking, adding this kind of insurance to your roadside assistance policy won’t be necessary. Also, many of the plans out there don’t even offer it, because it’s challenging to determine trip costs when you don’t have traditional expenses like plane tickets or hotel rooms. Still, the fact that Allstate can help compensate you if you do have to cut your trip short is a nice perk. There are some limitations and requirements to get this coverage, though, so be sure to read the fine print or contact an agent to find out more. Because this policy is offered through Allstate, most people would assume that you already have to have insurance through them to qualify. Fortunately, that’s not the case. You can either sign up for a membership or a pay-per-use plan regardless of which insurance company you have already. I like the cost-effective plan rates, as well as the essential services offered. Also, the pay-per-use plan is perfect if you want to minimize your monthly expenses, particularly if you don’t travel by RV that often. Most of the roadside assistance perks are meant for cars and trucks, meaning that you can’t expect to receive them while driving (or towing) your RV. Also, you do have to get the more expensive plan to cover your motorhome, so do keep that in mind. Finally, because Allstate isn’t as dedicated to RV coverage, you may have trouble getting the right services quickly and efficiently. Although most people don’t necessarily consider how “green” a company is when comparing different roadside assistance plans, it’s nice to know that Better World Club cares more about the environment than other options out there. If you want to do business with a company that values eco-friendly services, then you may want to sign up with BWC regardless of any perks it may have. Fortunately, there are some decent benefits to getting a membership. If you’re curious what it means to get a plan with an eco-friendly auto club, two primary services show the company’s commitment to the environment. First, you can buy carbon credits to offset the emissions from your RV (and any other vehicles you drive). Second, this is probably the only auto club that provides coverage for bicycles as well as motor vehicles. Thus, if you like to ride your bike when you travel in your RV, you can include bonus coverage so that you’re prepared no matter what you’re riding in at the time. As with most roadside assistance plans for RVs, you can receive some decent discounts when you book travel arrangements, such as hotels and airfare. The rates and savings are similar to the other plans we’ve looked at so far. However, on top of the standard booking discounts, this club also gives you membership points, which you can redeem for various perks like movie tickets or retail items. You get points for referrals, as well as non-usage in any given year. Compared to other roadside assistance plans, Better World Club is pretty similar. However, I like that the company cares about the environment, and I appreciate the bicycle coverage, particularly if you ride wherever you travel in your RV. You do have to get the premium package to get coverage for a mobile home, so plan on paying the highest price. That being said, it works out to about $11 per month, so it’s not that bad. Other than that, there are no significant downsides to this service. Like AAA or Better World Club, Paragon is an auto club designed to help drivers stay safe on the road. However, even though this club is mostly intended for cars, trucks, and SUVs like the others, it also offers some pretty sweet benefits for RVers as well. Let’s see how well it stacks up. As you have most likely noticed already, traveling in an RV is much different than going around in a regular car. You have to plan your routes accordingly, meaning that you have to find different service areas and rest stops along the way. Fortunately, Paragon can help you out by providing comprehensive trip planning services. Not only can you be sure that you won’t run into potential issues on the road, but they can suggest points of interest that are easily accessible via RV. Most roadside assistance plans cover the basics, such as battery jumpstarts, flat tires, and towing services. However, if your RV is stolen while you’re on vacation, you want to have peace of mind about that as well. Yes, your RV insurance should cover theft, but it’s nice to know that your club membership can also provide compensation if the worst happens. Most basic roadside assistance plans don’t offer mechanic services, meaning that if there is something wrong with your RV, you have to get it towed to a shop, which can be costly and derail your vacation plans. With Paragon, you can get a mechanic to come to you, which could be a huge benefit. Rather than paying a ton of money to get it fixed at a shop, you can be on your way much faster, and Paragon covers up to $100 of the costs. Compared to other auto clubs, Paragon offers some decent benefits for RVers on the road. I like the variety of services, as well as the fact that the highest membership can cover most of your emergency expenses. Pricing can vary depending on where you live, so keep that in mind. Also, any roadside assistance (including towing) is reimbursed, meaning that you have to pay upfront if something does happen. Although you can buy a separate auto club plan that will protect you and your RV during your travels, you may be able to get roadside assistance included with your insurance. Here is a perfect example of that with Progressive, so let’s see how well this stacks up. Vacation Interruption Coverage: if you’re more than 50 miles from home, you can get covered for costs like hotels or travel fees if your RV breaks down. Theft and Damage Protection: not only protect the RV itself but the contents inside. Full-Timer Insurance: if you RV full-time, you’ll want additional insurance, so you’re always protected. When it comes to roadside assistance, this plan has all of the basics, including towing (up to 100 miles), flat tire service, fuel delivery (extra charge), and battery jumpstart. If you’re worried about roadside assistance for emergencies, then bundling it with your insurance is probably the best way to go. This is a perfect example of a comprehensive policy that protects you and your RV at all times. If you don’t have Progressive, you’ll have to switch if you want these services. Unlike Allstate, you can’t get a membership independently of an insurance policy. When comparing different roadside assistance plans, you can choose one based on either the driver of the vehicle or the vehicle itself. Let’s examine the pros and cons of each option. In this case, it doesn’t matter what you’re driving, meaning that you can change RVs or drive a rental and still be covered. This kind of plan is beneficial if you’re the primary driver anyway, as it offers more flexibility. If you’re sharing the driving responsibilities with other people (i.e., spouse, friends, etc. ), then vehicle coverage is probably better. Typically, roadside plans charge extra for each person on the policy, so you can ultimately save money in the long run. Does Your Car Insurance Provide Roadside Assistance? Typically speaking, most auto insurance plans will offer some kind of roadside assistance package. Assuming that you have full coverage on your RV, you should talk to your insurance agent about what services are provided, particularly how many are offered in a given year. Depending on the benefits available, you may not have to buy a separate roadside plan, so keep that in mind — no sense in paying for something you already have. Because Good Sam is explicitly designed for RVs, I have to say that it is my top pick for any RVers out there. Whether you drive on the road full-time or you vacation multiple times throughout the year, Good Sam is perfect for any protection you need. That being said, if you only take your RV out on occasion, the monthly price may be a little much, particularly if you’re already paying for things like auto and RV insurance. In that case, a standard auto club membership may be preferable.